Here are the top 5 granite care products to consider for your home or office. Natural stone and granite care and maintenance products for floors, walls, and countertops made of granite, marble, limestone, slate, travertine, and more. 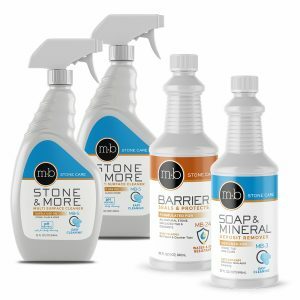 MB Stone offers a family of countertop care products including MB-24 Impregnator / Sealer, MB-5 Marble, Granite and More Spray Cleaner, MB-3 Soap Film & Mineral Deposit Remover, and GT-1 Environmentally Friendly Granite Cleaner. What you read about natural stone countertop care can be misleading. For example, you should never clean granite with dishwashing soap or glass cleaner. See Granite Care Instructions for full written and video instructions for cleaning and sealing granite. Note: When we install granite countertops, we provide all customers with a stone care kit that includes MB-24 Granite Sealer and MB-5 Granite Cleaner … all professional quality granite and marble care products! Easily repair granite countertops and save hundreds with the Granite Countertop Repair Kit. Everything you need to repair granite cracks and chips. Even improve granite seams. Complete instructions, do-it-yourself. This unique and convenient granite repair kit lets you restore and repair granite, marble, onyx, limestone, and other natural stone surfaces with this convenient to use product. You can even repair quartz and quartzite countertops. Welcome to Rare Earth Stone Products, the Granite Care Pro, your source for the best performing natural stone care products. We started as a granite countertop manufacturing and installation company over 16 years ago. Installing thousands of countertops, we discovered MB Stone Care granite sealer and cleaner products. MB Stone Care products are quite different from others and experience has shown us they are the best choice to protect your granite and stone countertop investment. Every countertop we installed was sealed with MB Stone Granite Sealer and we provided each customer with ongoing care products from MB Stone. Thank you for your trust. Sealing Granite Countertops But Only If They Need It!